Danny Peterson | 3/7/2018, 10:46 a.m. 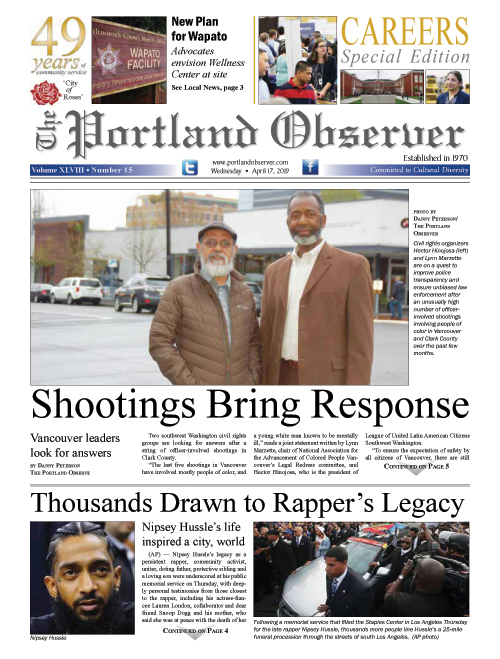 The housing will be prioritized to low and moderate income families who were involuntarily displaced by urban renewal, redlining and gentrification from north and northeast Portland, the historic heart of Portland’s African American community. PCRI, an African-American led organization, has provided affordable housing and home-owner services to low-income families since 1992. It’s estimated that over 10,000 African Americans were priced out and displaced from their historic neighborhoods from 2000 to today, the most recent chapter in a decades-long history of displacement in the area, PCRI President Maxine Fitzpatrick recounted in her opening address at the ceremony. “Today we start the process of addressing those wrongs and implementing a process of justice. Today we celebrate,” she said. In 2015, PCRI worked with Portland’s Housing Bureau to try and atone for the city’s gentrification sins by adopting a “right to return” policy to give preference for affordable housing and home loans in the historically black areas to those who’ve been displaced from there—the first policy of its kind in the nation. The initiative provides city loans of up to $100,000 for a down payment. Five households have been able to purchase homes under the experimental policy, called N/NE Neighborhood Housing Strategy. Fitzpatrick said she and PCRI will be working with the Portland Housing Bureau to revise the policy to be more effective and hopes Pathway 1000 will also attract more buyers. A meeting between Mayor Wheeler and the committee overseeing the strategy is scheduled for later this month to discuss improvements that could be made. The policy came in the wake of a city-proposed Trader Joe’s at the corner of Northeast Martin Luther King Boulevard and Alberta Street four years ago, which sparked community outcry of further displacement, and prompted City Commissioner Dan Saltzman and then-Mayor Charlie Hales to pledge $20 million for housing initiatives. A home-owner who was placed into housing through PCRI shared her journey at the ceremony of buying her first home, a three bedroom condominium in northeast Portland in July. Arika Bridgeman-Bunyoli, a health educator for Multnomah County, said she was paying about 45 percent of her income to rent each month and was barely able to keep herself and her two young children afloat financially. In 2012, when she went to the offices of PCRI for help, she was practically in tears. The building site on Williams will accommodate four townhomes with two and three bedrooms, two and three stories each, respectively, and comply with Earth Advantage green building standards. The homes are scheduled to be completed late 2018 in partnership with locally owned Albina Construction, Brett Schultz Architect, and lender Beneficial State Bank, with grants from Wells Fargo Housing Foundation and the Meyer Trust helping to ensure the homes are affordable to low-and-medium-income buyers. Fitzpatrick thanked the Portland Housing Bureau, Mayor Ted Wheeler, and Commissioner Dan Saltzman, and the PCRI team for their support. More groundbreaking for Pathway 1,000 homes are slated to occur in the coming months, one on Balendena Avenue and one on the corner of Martin Luther King and Rosa Parks Way, Fitzpatrick said.